During summer months, the Carousel is open seven days a week, weather permitting. For hours, admission fees, and additional information call 212.439.6900 (ext. 4). The famed Carousel, with its sweet calliope music and 57 magnificent horses, is the fourth to stand in Central Park since 1871. It is one of Central Park's most popular favorite attractions. It is said that a live mule or a horse, hidden beneath the Carousel platform, powered the original amusement ride from 1873 until 1924. The animals were taught to start and stop when the operator tapped on the floor. The next two Carousels were destroyed by fire, the first in 1924 and its successor in 1950. Searching for a replacement, the Parks Department discovered the current vintage carousel abandoned in an old trolley terminal on Coney Island. 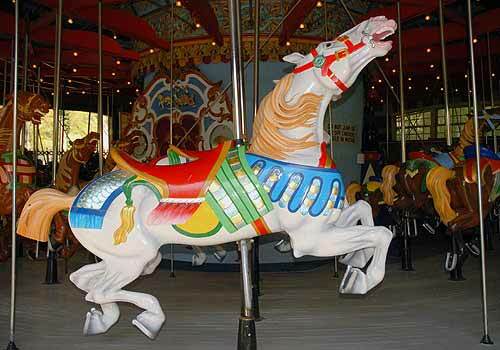 The Brooklyn firm Stein & Goldstein crafted the piece in 1908, and it remains one of the largest carousels in the United States and finest examples of American folk art. In 1990, Central Park Conservancy restored the Carousel landscape and surrounding plaza. Each horse is also being restored.